For students concerned about their dreams being too big, OCCC graduate and KFOR news anchor Lacey Lett said no goal is unattainable. Lett said she earned an associate degree in broadcasting at OCCC in 2004 before graduating from the University of Oklahoma in 2006. Since then, Lett has become a local celebrity as a television and radio host, news reporter and magazine columnist. In 2008, Lett said she left Oklahoma for New York, where she worked for MTV and VH1. She said she did production work for a VH1 show called “That Metal Show” and also helped develop a short documentary to accompany the Beatles edition of the “Rock Band” video game. “ … I worked the Video Music Awards for two different years,” Lett said. “I was right next to Lady Gaga’s meat dress,” she said. “I had no idea it was a meat dress … it looked different in person. While attending OU, Lett said, she interned at Clear Channel Communications before being hired for an on-air radio job. She said she owes her former OCCC Mass Communications Professor Gwin Faulconer-Lippert for the opportunities she was given at Clear Channel. Faulconer-Lippert said she is proud of Lett. “Lacey Lett is one of our most outstanding graduates,” she said. English Professor Sue Hinton taught Lett in News Writing at OCCC and watched her grow as a Pioneer staff writer. “ … She’s a student who learned as much as she could as fast as she could. She has put in the work to be where she is [today]. 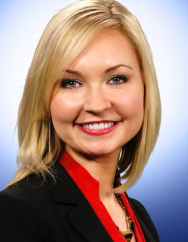 Lett said she hosted a lifestyle show in Tulsa before becoming a morning anchor and reporter for Oklahoma City news channel KFOR. She said she also writes for the Oklahoman as a columnist for “Look at OKC Magazine” and hosts a show called “Rise and Shine” on KAUT. Lett said she grew up in south Oklahoma City and graduated from Southeast High School, which qualified her for OCCC’s OKC-GO program. The OKC-GO program is exclusive to OCCC and is designed to remove some of the financial barriers that might limit a student’s ability to succeed in college. The program allows graduates from Oklahoma City public schools to attend OCCC for up to three years for free. “My parents saw this as an opportunity to send me to college for free,” Lett said. “It was a great transition, honestly,” she said. She said she also was honored to have recently been inducted into the 2013 OCCC Alumni Hall of Fame. Lett said despite not having the same opportunities as others, she worked hard and achieved her dreams. “If you think you can, you will,” Lett said. Lett can be seen on KFOR starting at 4 a.m. weekdays. For more about Lett, visit http://kfor.com/author/laceylettkfor. Also, follow her on Twitter @laceylett.